According to a report released earlier this week, five years of consecutive flat or below-inflation funding of the budget of the National Institutes of Health (NIH) is discouraging promising young researchers and endangering the future of America’s health . The study warns that many of the brightest young minds are leaking out of the academic research pipeline because they no longer see a promising career in academic science. Indeed, America could lose a generation of promising researchers to other careers and other countries. The report profiles 12 exceptional junior researchers from institutions across the country who were selected by senior scientists and university leadership for their potential to make significant scientific contributions. The young researchers are working on new methods to manipulate adult stem cells to repair the heart, identifying critical biological pathways involved in cancer and progressive brain diseases, determining the mechanisms of pain and heat sensation, searching for genetic causes of age-related hearing loss, and using new technologies to detect kidney disease in its earliest stages. The harmful effects of these breaks in the scientific pipeline are felt, ultimately, in America’s health and economy. Conservatism and delays at the research bench reduce the scope and pace of scientific discovery and, eventually, the rate at which medical advances improve health outcomes for all of us. The report can be downloaded directly from BrokenPipeline.org. You can also download a related report released last year by a group of nine institutions across the country titled “Within Our Grasp — Or Slipping Away? Assuring a New Era of Scientific and Medical Progress”. The report showed how flat NIH funding, combined with inflation, was eroding research budgets and forcing scientists to downsize their laboratories and abandon innovative and promising work . In spite of all this, the President’s budget proposal for fiscal year 2009 recommends a sixth year of flat (and with inflation, decreased) funding for the NIH. 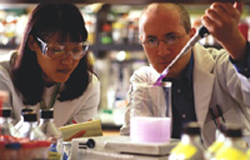 Congress has begun work on funding for biomedical research to improve health in fiscal year 2009. Several Representatives are leading an effort to increase NIH finding by 6.5% and have invited their colleagues to join them on a letter to Appropriations Chair David Obey (WI) and Ranking Member Jerry Lewis (CA). Research!America, an alliance for discoveries in health, makes it easy to contact your Representative and urge them to sign this important letter. Biomedical research innovation and advancement are critical to transformation of medicine from reactive to preventative, predictive, and personalized. I encourage you to support increased funding for research to improve American’s health. Research!America reports that the Senate overwhelmingly approved an amendment to the FY09 budget resolution that calls for an extra $2.1 billion to the NIH budget. You can read more about this First Step Toward Unflattening the NIH Budget at Research!America. A Broken Pipeline? Flat Funding of the NIH Puts a Generation of Science at Risk. Brown University, Duke University, Harvard University, The Ohio State University, Partners Healthcare, the University of California Los Angeles, and Vanderbilt University. 2008 Mar 11. Within Our Grasp — Or Slipping Away? Assuring a New Era of Scientific and Medical Progress. The University of California, Columbia University, Harvard University, Johns Hopkins University, Partners Healthcare, The University of Texas, Washington University in St. Louis, The University of Wisconsin, and Yale University. 2007 Mar 19.